Founded in 1931, the British Kinematograph Society (now the British Kinematograph, Sound and Television Society or BKSTS) was created to provide resources and training in the film industry. 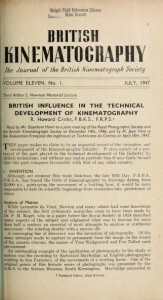 The journal issues collected here date from 1947 to 1953 and cover a range of technical issues related to cinematography. BKSTS still publishes a quarterly journal, now called Cinema Technology.